KSBA members and officers are staffing the Honey Booth at the State Fair. 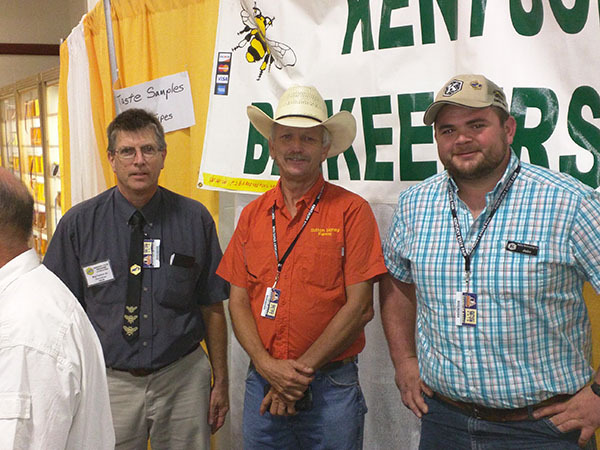 The Honey Booth offers KSBA members a chance to sell their honey, wax, and related products to fair-goers from across the state. It is also an excellent education and outreach opportunity to help people learn more about honey bees, local honey, and beekeeping. The fair is open until August 29 if you want to stop by and see the Honey Booth for yourself. Pictured from left to right are Ray Tucker (KSBA President), Rick Sutton (KSBA President-elect), and Jacob Osborne (KSBA Vice-President).